Arithmetic Progression is the sequence of numbers such that the difference between the two successive terms is always constant. And that difference is called the Common Difference. It is also known as Arithmetic Sequence. The first term of the sequence is called the Initial Term which is denoted as ‘a’. The difference by which the consecutive numbers of the sequence increases or decreases is called the Common Difference, which is denoted by‘d’. Let’s check the value of the 5th term using the nth term formula. It is given in the right figure that the 5th term is 9. The arithmetic progression with a limited number of terms is called Finite Sequence. It has a last term. The arithmetic progression with unlimited number of terms is called Infinite Sequence. It does not have a last term. It depends upon the value of the common difference that the arithmetic progression is increasing or decreasing. If the common difference ‘d’ is positive then the arithmetic progression will increase towards positive infinity that is, it will be an increasing sequence. This is an increasing sequence with a = 11 and d = 11. If the common difference ‘d’ is negative then the arithmetic progression will rise towards negative infinity that is, it will be a decreasing sequence. This is a decreasing sequence with a = 20 and d = -10. If the terms of the arithmetic progression are increased or decreased with the same number then the resultant sequence will also be an arithmetic progression. Hence, this is also an arithmetic progression. If the terms of the arithmetic progression are multiplied or divide with the same number (non-zero) then the resultant sequence will also be an arithmetic progression. Hence, this is also an arithmetic sequence. 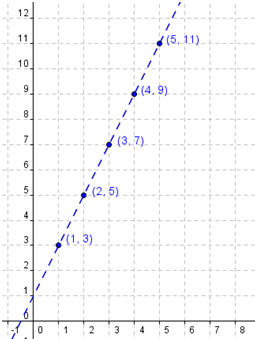 The Arithmetic Progression can be shown through the graphs also. It could be on number line or on the Cartesian plane. Here we need the Cartesian coordinates to represent it on the Cartesian plane. an is the nth term, so the corresponding Cartesian coordinates will be in the form of (n, an ). When we add the terms of the arithmetic progression then that sum is the arithmetic series. Like, the AP, the difference between every consecutive term is always constant. What is the 10th term of the series 2 + 4 + 6 + 8 +…? Here n = 10 as we have to find the 10th term. Hence the sum remains the same if we calculate with the formula. Arithmetic Mean is basically the average of two numbers. If we have two numbers n and m, then we can include a number L in between these numbers so that the three numbers will form an arithmetic sequence like n, L, m.
In that case the number L is the arithmetic mean of the numbers n and m.
L – n = m – L  that is, the common difference of the given AP. 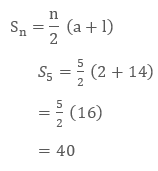 This is generally used to find the missing number of the sequence between the two given numbers. What will be the 6th number of the sequence if the 5th term is 12 and the 7th term is 24? As the two numbers are given so the 6th number will be the Arithmetic mean of the two given numbers. Hence the 6th term will be 18. We can insert two or more numbers between the two given numbers to form an Arithmetic Progression. Let A1 , A2 , A3 , …, An be n numbers between a and b such that  a, A1 , A2 , A3 , …,An , b is an A.P. Here, b is the (n + 2) th term, that is, b = a + [(n + 2) – 1] d = a + (n + 1) d.
Insert 5 numbers between 3 and 21 such that the resulting sequence is an A.P. the sequence is in A.P. 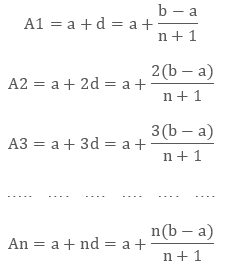 Here, a = 3, b = 21, n = 7.